The first thing that I would suggest is cutting out the bounce lands. Not only do they put you a land behind, but they also put you a turn behind. That's something narset can't afford. It would be better to replace those lands with basics until you can grab the shocks. Next, I would take out all equips and replace them with buffing enchantments like Indestructibility and Tricks of the Trade. Steel of the Godhead is also a wonderful include along with Volcanic Strength. Replace manalith with Darksteel Ingot. Ideally, you don't want 3drop mana rocks, but darksteel is better than manalith until you can grab moxes. I would replace the creatures with either stax pieces or spells that make tokens, just so you don't fizzle on a narset attack. Rhystic Study, Mystic Remora, Ghostly Prison, Smoke, Raise the Alarm, Talrand's Invocation. The last two aren't great, but they all provide a small amount of protection against attackers. Replace Minds Aglow with Mind Spring for a better effect. Cool deck so far! 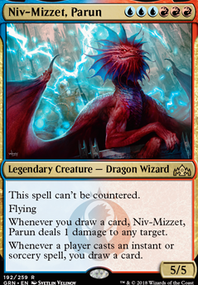 Looks like you've got some really strong cards in RWB and a killer commander, but your deck might be a little unfocused (which is really hard to avoid in your first EDH deck -- 100 cards is a lot of slots to fill with meaningful cards). Okay, so probably the best way to improve your deck at the beginning is to decide on what you want the deck to do. Do you want your deck's strength to be lifegain? reanimation (bringing stuff back from grave)? or pure and simple combat strength? Once you decide how you'd like to win, then make sure every card in your deck helps you accomplish that, either through directly enabling those win conditions or by hindering your opponent. The way your deck lacks focus right now is that you've decided on too many cool strategies at once (I see a mix of all three of the strategies I described), so your cards won't always be useful. I see your strongest strategy right now is control/lifegain with a little bit of reanimation mixed in (all your Vampires support this, in additon to Tariel, your planeswalkers, and the majority of your creatures). However, cards like Serra Angel, Wispweaver Angel, Secure the Wastes, Brute Strength, Flamespeaker's Will, Pacifism, Volcanic Strength, Ponyback Brigade, Grave Titan, and Bad Moon don't seem to promote either of those goals. You can probably identify some other cards, too. 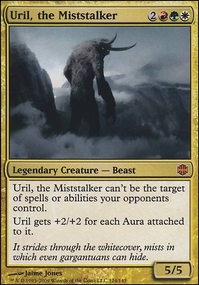 The first step to making a tightly focused EDH deck is to replace those cards with cards that enable your primary goal. I would recommend cards like Inferno Titan, Searing Meditation, Sunbond, Divinity of Pride, Ayli, Eternal Pilgrim, Sunscorch Regent, Wall of Reverence, Well of Lost Dreams, Greed, Phyrexian Reclamation, Firemane Angel, Firemane Avenger. These either help you get opposing creatures into the graveyard so that Tariel can Reckon them, or they keep your life total high. Obviously those aren't necessary, they're just cards that have worked for me on my lifegain deck. Also, you don't want to remove all of your utility, so I'd totally keep some cards like AEther Snap or Kill Shot -- you just don't want so many that you can't draw cards that help you win. Best of luck brewing! Hope this helps. Really love the concept of your deck, and let me know if I can help. Sweet deck! I didn't realize how interesting Yasova was to me until I started thinking of ways to use her ability better. I see you have Willbreaker, letting you keep the creatures you temporarily steal. Some other options for keeping these creatures past the end of the turn could be Conjurer's Closet, Deadeye Navigator, Synod Sanctum, Cold Storage, Nephalia Smuggler, and Ghostly Flicker, which all return creatures back under your control without you having to return them to their owners. You could also use Hellkite Charger, Breath of Fury, or World at War to trigger Yasova's ability multiple times per turn. With Glaring Spotlight, you can steal your opponents' creatures that have hexproof. To steal your opponents' noncreature artifacts, try turning them into creatures with options like Toymaker and Titania's Song, and to steal your opponents' noncreature lands, try turning them into creatures with Lifespark Spellbomb or Quirion Druid. Land suggestions include Command Tower, Frontier Bivouac, Rootbound Crag, Opal Palace, Lumbering Falls, Temple of Abandon, Temple of Mystery, Vivid Crag, Vivid Creek, and Vivid Grove. If you don't want to give the creatures back after you've stolen them, you can use sacrifice effect cards to get rid of them for profit. 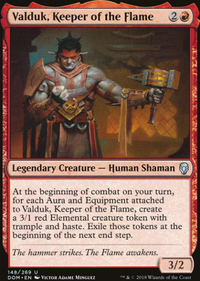 Some powerful sacrifice engines include Ashnod's Altar, Culling Dais, Barrin, Master Wizard, Bloodshot Cyclops, Jalira, Master Polymorphist, Profaner of the Dead, Scourge of Skola Vale, Evolutionary Leap, Goblin Bombardment, Perilous Forays, Shivan Harvest, Momentous Fall, High Market, Life's Legacy, and Primal Growth. To make your opponents' creatures easier to steal, you can use power-reduction cards such as Cumber Stone, Schismotivate, Downsize, Dampening Pulse, or Agoraphobia. Alright, so here's some things I have on hand that go in line with some of this. Bonds of Faith, Basilisk Collar, Scourge of the Nobilis,Ethereal Armor, Volcanic Strength, Tricks of the Trade. Vow of duty and sphere of safety will be going in as well as Bonds of faith. Herald of Dromoka is your only warrior. So he has no reason to be here. 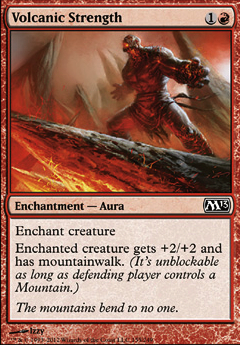 Volcanic Strength can be replaced by many other enchantments that are like it but better, but I think it would suit you better as another aggressive creature. Or possibly as some Lightning Bolts which you should play 4 of. Lightning Strike should be Lightning Bolt. If you already put bolt in from my earlier suggestion maybe try Lightning Helix. Barbed lighting is horrible. Just don't play it. It's 3 mana to do what should only cost 1. White enchantments boost toughness (not only power), which enables the creature to attack into an opposing blocker if required and survive. In this deck, you need both the power boost plus finding one of your evasion (or semi evasion like Madcap Skills) cards as well, else you are doing suicide trample attack. Call of the Full Moon seems a bit weak. I think due to the issue with toughness not being boosted, you need more evasion aura's in that slot. I think 4 Treetop Bracers would be great. Sideboard: Some Volcanic Strength would be good if you did a SB. Great deck you have there! Amazing how similar they are :D I think you may want to reconsider including Daybreak Coronet as they are down in Price to about 7$ or less. Oppressive Rays or Gelid Shackles seem like good cards to run, now that Splinter Twin is out of the Meta and you do not necessarily need to be able to react at instant speed. I will definitely test with them. Also i am a big fan of Volcanic Strength i think you should try it! It's the absolute nuts against any red deck and still fair against any other deck. Good luck to you too!